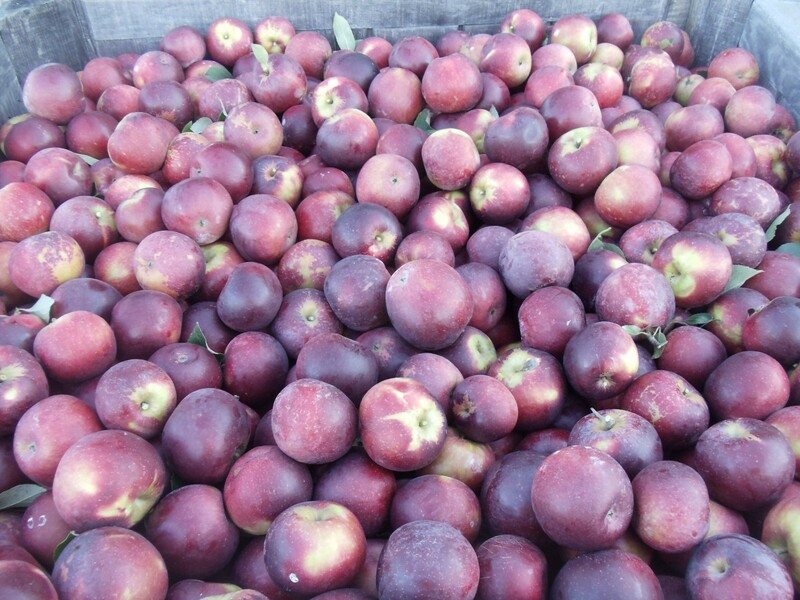 Arkansas Black apples are firm, crisp and tart. Great for cooking and stores well. Come on out and enjoy this beautiful fall day and pick up a bag of delicious apples; Mutsu, Jonagold, Golden Delicious, Stayman/Winesap, Red Rome, Gala, Fuji, Red Delicious, Cameo, and Granny Smith. Don’t forget to visit our bakery for some hot Apple Cider Donuts, Pumpkin Donuts, Apple Caramel Cake or another delicious treat. Cameo apples have a flesh which is dense and creamy yellow colored background with red striping over it in color with a crisp and juicy texture. The Cameo’s flavor is the perfect balance of sweet and tart. It is a good apple for snacking and to use fresh in salads. It is also a good cooking apple and makes great desserts. The Cameo stores well when refrigerated. Fresh picked Gala, Fuji, Mutsu, Jonagold, Golden Delicious, Red Delicious, Red Rome, Shizuka and Granny Smith in the market. 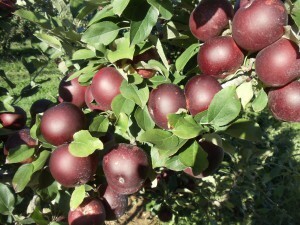 The Red Rome apple is one of the oldest apple varieties grown. It is red in color with a thick skin and firm flesh with an occasional red streak. It is primarily used for baking, as its flavor develops when cooked, and it holds its shape well. It also is considered a good keeper. 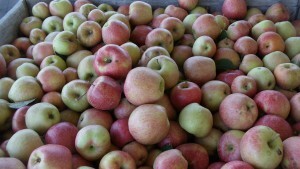 Fresh picked Gala, Fuji, Mutsu, Jonagold, Golden Delicious, Red Delicious, Shizuka and Granny Smith apples in the market. Cameo apples will be picked Saturday. See you at the farm. 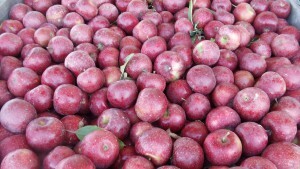 Fresh picked Mutsu apples at the farm. 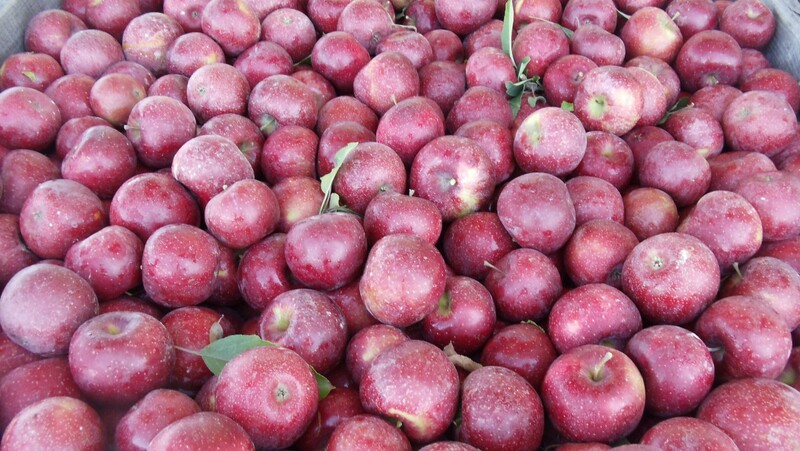 Mutsu apples are firm, crisp and juicy with a sweet-tart flavor. 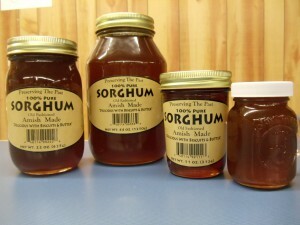 Great for eating fresh and cooking, especially apple sauce with very little sugar needed. 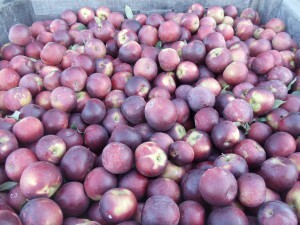 Red Delicious, Jonagold, Golden Delicious, Granny Smith, Gala, Fuji and Shizuka apples are also available at the farm!